Hello everyone! This is my very first post covering my blogging experience and income related updates. I have been trying to share my round-up posts on my blogging experience of every month for so long but never been able to give it a try. So here I am sharing it today. 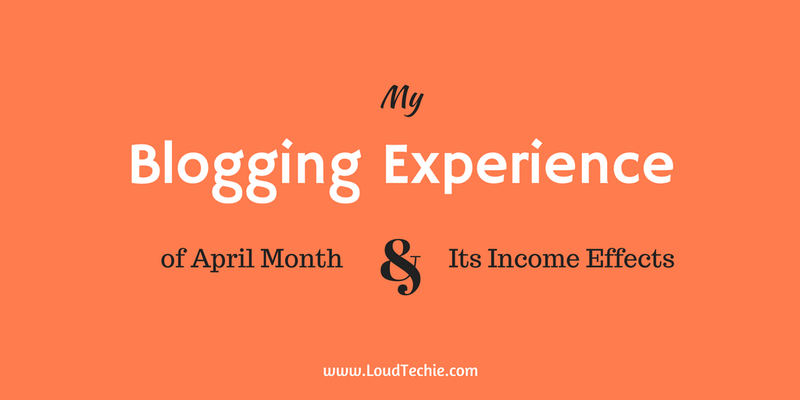 In this post, I will be trying to share my past one-month blogging experience here on LoudTechie blog. To be very honest, last month wasn't good for me and my blog. My blog went through many changes through this past one month, as I changed my blog theme from a freemium Justwrite theme to a premium Thrive theme. And got one critical error right after changing my theme. My blog was down for straight two days and I was stuck with customer support of my hosting providers and thrive theme support. Both were looking to solve that issue and at last, after two days I got an email from my hosting providers saying that they have found the issue and it was "query limit is exceeded for the database user". Query limit is the maximum number of database actions performed in one hour by a specific user. The maximum number of database queries per user is 75,000/hr. So I decided to migrate my site to some other hosting service. I researched a lot about better hosting plans with good performance and I found one perfect hosting which is InterServer web hosting. So those were the changes I went through this past month which included a theme change and hosting change both within the first half of the month. I lost many good traffic because of these changes. The second-half month was also not as I expected. After I migrated to InterServer hosting. I got to use their free SSL feature and I asked them to activate it for my site. The support was good and they made the changes I asked them to do. While migrating from HTTP to HTTPS my site got into another issue and it was effecting my site layout and many links and images. My site was down again for some time. As while migrating from HTTP to HTTPS most of the sites go through one common issue that some of your internal links do not turn to HTTPS just by activating SSL on your site. Sometimes one needs to create redirection for it. And same happened with me. I had to use one redirection plugin to create redirection for my site images and some internal links. When everything was setup perfectly and site was performing good,I found that changing my site from HTTP to HTTPS have effected social share counts of my entire site. Some of my posts used to have social shares counts in thousands and now they are ZERO. There are only two solution to recover my old social share counts:? Go back to HTTP version of my site. Social Warfare PRO plugin: This is the only plugin available till now which can recover your lost social share counts. But even this has some conditions with it. If you have removed/uninstalled this plugin the recovered social share counts will also be removed. That is what stopped me from using it for my site. This HTTP to HTTPS also effected my site ranking and indexing. But this can be recovered after some time. Redirecting to HTTPS is one profitable risk you can take as Google gives priority to HTTPS urls. And you can see that the first two pages of every google search result are having 70-80% urls with HTTPS version only. My previous theme was a free theme but as a starter I picked one well optimized Adsense theme. My Adsense earning had just started doing good. You can see in this image my all time Adsense income earning report. My last three months are showing same income as the payment was set on hold for the bigger amount. In my past 2-3 months I used to earn average $2-3 per day and monthly $70-$90. But after changing my site theme to a premium theme all my Adsense earning has fallen badly. I knew it would happen as thrive theme is more of an affiliate optimized theme and not Adsense optimized theme. You can see how it kept on falling in April month stats. All because of changing my WordPress theme. In this busy month of April I got time to cover only 6 articles to publish. In case you missed any of my previously published articles I am sharing all 6 articles in this article. Just to get you updated. One article was on covering 5 great tools to create your own Podcast. Creating podcast is one trending topic these days and many bloggers are turning their content to podcasting to reach the non-reading customers. An article on content repurposing social media sites. Yes, I once shared an article on best content syndication sites and this time I have covered content syndication social sites. If you are into blogging this is important article is just for you. I have recently migrated to InterServer hosting. So I decided to write a review post on it. If you are looking for a good hosting service for your blog then this InterServer hosting comes with Free Migration, Uptime Guarantee, Money back Guarantee and Easy Control Panel. You can visit the link below for more details on InterServer hosting. InterServer Review: What Makes It A Perfect Web Hosting Over Others? My last article is on WordPress itself, this article is on permalink structure in WordPress. It is one of the basic things that every blogger needs to do when starting a WordPress blog. Setting up a perfect WordPress permalink structure is very important part to have an optimized WP blog. So in this article I am covering everything about WordPress permalink structure. Which is the best permalink structure? Why one should change its default permalink structure? Why having date/months in your URL is not good for your blog? So this is everything I want to share in my very first roundup post covering all the changes and issues I went through in the month of April. I hope it was an interesting read for you. I would love to hear your views about it via comments or if you want to share any of your past experience related to these issues I would love to hear them too. i read Your blog its very helpful for me thanks for this keep doing the good work. i read your blogs it’s always being helpful for me ,keep doing this. Thanks! You can also subscribe to get all our updates. i always read your blogs and found really a informative one. Thanks Shweta for stopping by. Your feedback is important to us keep visiting. I love to read your blog. learnable blog. Thanks for sharing your income report this will really motivate bloggers. Hello Author I read your blog regularly your blogging skills is very good keep it up !